When it comes to watch brands, some names are simple ones (“Timex”) and others are a handful (“Vacheron Constantin.”) In that vein, Parmigiani Fleurier watches definitely fall into the latter camp; that name is a mouthful, and if you’re an American, it’s not a name that you’ll pronounce easily. You will definitely want to remember it, however, as these watches are innovative, well-crafted, loaded with precious metals and gemstones, come with a generous assortment of complications and are uniquely attractive. That said, they’re also quite expensive, but that’s to be expected. Parmigiani Fleurier watches first came to market in 1996, in the Swiss valley of Val-de-Travers, and the founder of the company wanted to build high quality, attractive watches that were inspired by models crafted years ago by other companies. All of the company’s watches are built by hand, and feature hundreds of parts and require dozens of hours of labor to assemble. While the brand is not yet a household name, you’ll find that once you’ve seen a few Parmigiani Fleurier watches, you won’t forget them. 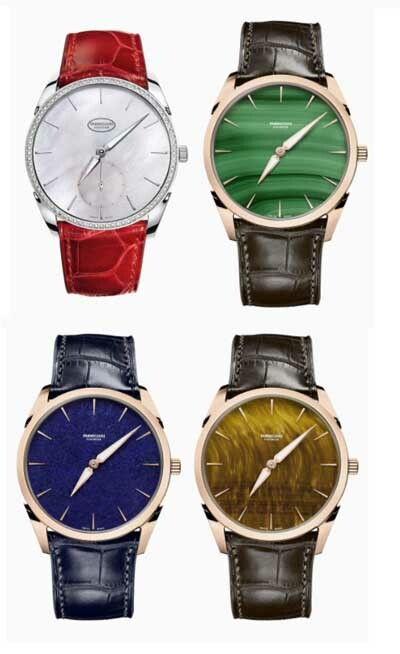 Read on for the full Parmigiani Fleurier watches review. The build quality is exceptionally good. Each watch takes some 400 hours to build, and each movement has hundreds of parts. Cases are made from stainless steel, titanium, platinum, and gold, and the watch faces are protected by rock-hard sapphire crystal. Water resistance varies by model, but most are rated at relatively modest levels in the 30-50 meter range. Than again, these are not diving watches, so that level of water resistance is likely adequate. You’ll also find screw-down crowns and trasnparent case backs in the company’s product line, with sapphire crystal used on both sides of the cases. When buying, you’ll have the option of manually wound mechanical movements, automatic (self-winding) mechanical movements, and quartz electronic movements. Unlike many Swiss watch companies, which use movements sourced from elsewhere, these watches use movements that are built and designed in-house. This allows them to create movements for specific models and features, rather than having to rely on the feature set of off-the-shelf third party movements. You’ll find a variety of features and innovation here; they offer models with date complications, day/date complications, power reserve indicators, small second dials and even a model with a tourbillon. They’re proud of their innovative movements; one of them is actually made from parts fashioned from gold. Gold is a particularly difficult metal to work with and offers a number of manufacturing problems, but they built a movement out of gold just to see if they could do it. 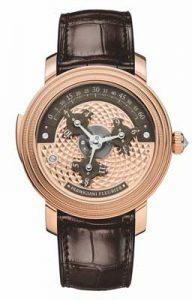 They also created a famous watch that was designed to look like the engine of a Bugatti automobile, the Parmigiani Fleurier Bugatti Type 370, which caused quite a stir at the Baselworld convention a few years ago. If you want a time-only watch, they’ve got those, too, but most of the product line will more likely appeal to fans of elaborate mechanical features. The styling isn’t as edgy as you might expect, though there are fewer round watches in their product line than you might ordinarily expect. About half of their watches are somewhat rectangular in shape, with straight tops and bottoms and slightly curved sides. Case sizes aren’t too extreme, with most watches in the ballpark of 40mm in case diameter. Precious metals and gemstones are featured prominently, particularly in women’s models, where you’ll find them on the bezel and even used on the watch face to depict the numbers themselves. There’s plenty of color to be found here, though most models utilize the basic black, white, gold, or silver that you’ll see anywhere else. If you want a red, green, or blue watch, however, they’ve got those, too. Most models are mechanical, though they do have a few with quartz movements. While they quartz models are at the lower end of the companies pricing, they’re not necessarily inexpensive, and are among the most expensive quartz watches we’ve ever encountered. Many models are limited editions, such as the Bugatti 370 model and their tourbillon model. Limited, in this case, sometimes means production of fewer than 10 pieces. The care and maintenance is more complicated than it would be for most timepieces, as most models feature elaborate mechanical movements. You’ll need to have the battery replaced in quartz models every few years, and you’ll likely want to send it back to the company to have that done. The company recommends that you have your mechanical models serviced every 4 to 6 years. This involves disassembling the movement completely, with every single part removed. They’ll be individually examined for wear or damage, and replaced, if necessary. Then the watch will be reassembled, tested, and examined for proper water resistance. Then they’ll clean it and return it to you looking like new. With proper care, these watches should be heirloom timepieces that you can hand down to family members for generations to come. For all of their elaborate work and expensive pricing, the warranty offered with Parmigiani Fleurier watches is average, which is not to say that it’s poor. You’ll get a two year warranty and that will cover defects in materials and craftsmanship. This is the industry standard warranty, and some 90% of watch companies offer a warranty of two years in duration. You’ll receive an additional two years of warranty each time you have your watch serviced. As designer or luxury watches go, the pricing is expensive, and range from “fairly expensive” to outrageously so. At the low end, you can buy a quartz model for as low as about $4500, though some of their quartz watches run well into five figures. At the high end, some ultra-limited models are priced upwards of $400,000. Most models are priced in the $8000-$20,000 range, putting them at the upper end of pricing as Swiss watches go. As with most luxury watch brands, Parmigiani Fleurier watches are sold only through an authorized network of selected retailers and through a few company-owned boutiques. This is done to keep prices steady, to avoid heavy discounting by retailers, and to avoid “diluting” the brand name. By restricting the availability of their products, the company can keep them rare and expensive. You can, however, occasionally find them for sale through third-party retailers, and they do often provide them for sale at prices that are lower than the suggested retail prices recommended by the company. This route is recommended if you’re looking to buy discount Parmigiani Fleurier watches. Not everyone is going to be interested in (or able to afford) the handmade, luxurious models that these watches have to offer, but if you are or can, you’ll find that they’re amazing timepieces. They offer excellent workmanship, some innovative design, gold, titanium, and diamonds, along with a good selection of features. They’re also interesting to look at, and, of course, they’ll keep great time. If you’re looking for a truly amazing watch that will draw attention wherever you go, Parmigiani Fleurier watches might be a good fit.